Picture top right: The Smith Family (from California, USA) in the Kalahari of Namibia. Dad Michael brought Kyle and Allison for a hunting trip to Africa. It's the dawn of 2010. It is usually with zest and new energy and zeal that we start every new year. We wish all of you a special and blessed 2010. 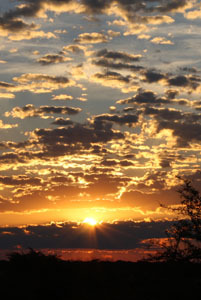 At the dawn of every new day (and year) we never know what is in store for each of us. It is still a mistery. But it is our comfort that nothing in this universe happens without it being part of God's plan. The year 2009 brought much joy and happiness to many people and we were privileged to meet and hunt with many hunters and their families from different countries on the globe. 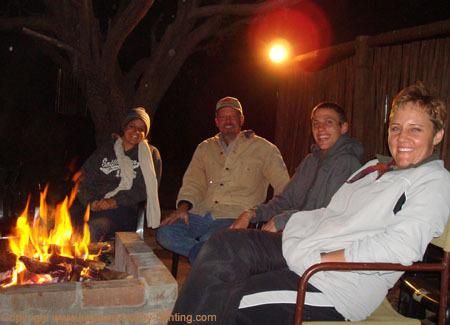 It is always enriching to get to know our clients during long hours of chatting around the campfire and hunting in the veld. From feedback we know that it's been just as enjoyable and special to our clients (now hunting friends). We want to thank each and every client for trusting us enough to put your money where your heart is... booking a hunt in the Kalahari of Namibia, Africa, were it in 2009 or in this year of 2010. We also want to use this opportunity to ask for your thoughts and prayers for friends of us who are currently grievously afflicted. Our prayers are with all of you in your specific circumstances. John and Eleanor, we think of you especially - may God give you strength and peace during her struggle with cancer. We celebrated in December Hendrik and Isabel's 40th anniversary! Congratulations to our parents. May God give you many more years together in good health and happiness. We know that you are thankful to be blessed in this special way. We are privileged to have you as a followsome example in life, faith and marriage. We planned to send out this issue of our Newsletter in November, but just couldn't find time to finish it. Then it was ready to send out end of December... and our telephone system was struck by lightning. Now it is repaired and we can finally get this Newsletter out to all of you! Here is an update on all the current news here in the Kalahari and also new pages on our website which may interest you. 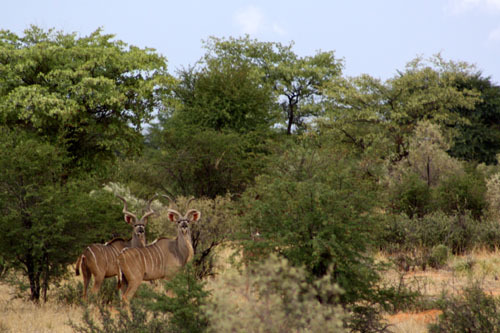 Picture above: Two young Kudu bulls in the Kalahari. We took this picture in November while there were new green leaves on the bushes and trees after a good rain shower. This year we were again just well aware of the extreme temperatures for which this home region of ours are known for. We had a few early rain showers, but the almost unbearable heat during November and December caused lots of grass to wither and we feared it may die. We have some day temperatures of 42°Celcius (104°F). Under these conditions, the temperature on open sand can become as high as 70°C (according to the experts). 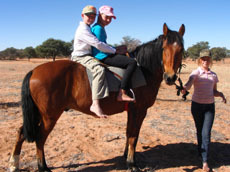 It is most of the time impossible to walk barefeet across the red sand of the Kalahari between 10h00 and 18h00. 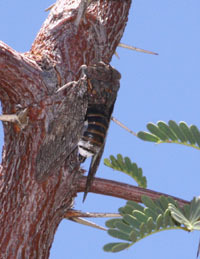 The picture on the left is a close-up we took of a Cicada also known in Afrikaans as "sonbesie" whose ceaseless, high-pitched call daily fills the Kalahari summer air. This sound is very typical of our summer months. We were surprised by a cloudy and wet New Year's day with rain showers for most parts of Namibia. The relief the rain brought to man and nature, was just indescribable. Since then, the whole country received more rain and we have good growth of grass and beautiful flowers on the veld. 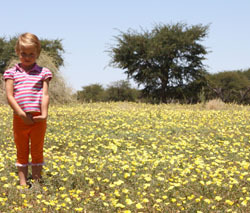 See on the picture of Isabella how the Kalahari is now dressed in its green-and-yellow outfit... covered with this very common after-rain flowers. This is such a welcome sight to all farmers! On the picture right is a Ground Agama male, making its territorial display from a prominent perch. This is a common lizard in the Kalahari and farmers belief that, when they are seen like this, rain will come soon because they will only breed in favourable conditions for the eggs to hatch - which is moist sand. For the animals (and people!) of the Kalahari, the summer months are the most stressful of all. Moisture in the air and on the surface is a scarce commodity and the mechanisms that enable the various types of wildlife and plants to cope with the heat are tested to the full. 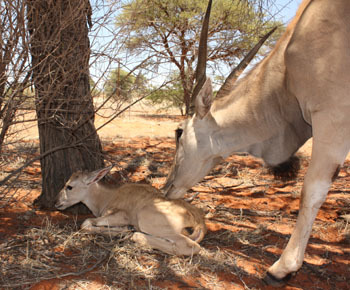 Read here how the Gemsbok antelope cope in extreme temperatures. The contrast of rain brings on a dramatic response of reproduction and breeding by the region's fauna and flora. A few years ago we raised this Eland female by hand and, whenever we drive up to her in the veld, she still comes to us for an apple or a pat! "Ellie" is named after the daughter of one of the hunters who were hunting with us at the time we found her as a baby in the veld. Two weeks ago we found Ellie with her firstborn calf (see picture). 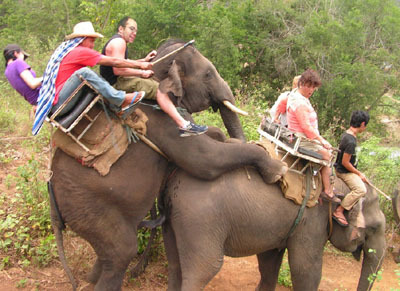 Picture: Copulation (which we were lucky to caught on camera) is a noisy affair! We know that the gravid female will lay 6 to 15 eggs in a pit which she excavates with her hind legs. She also urinates on the spot to soften hard soil. 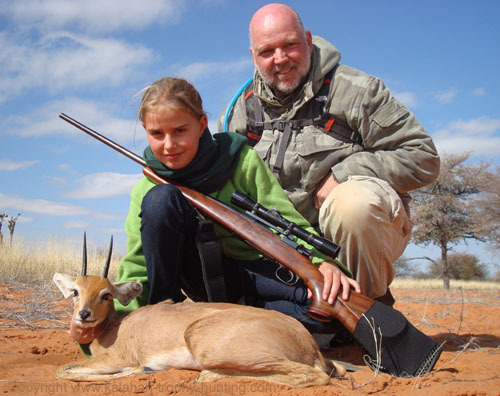 At the beginning of this year, we focus in this issue of our Newsletter on the families and especially children and young adults who hunted with us on Uitspan during 2009. "Is hunting good for kids? How do they feel about taking the life of an animal? 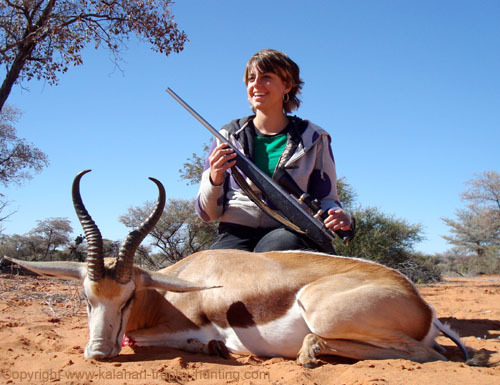 Does hunting wild animals encourage violence towards people?" These and many more questions may be asked about youths introduced to hunting. Michael Gurian, best-selling author of several books on how to properly raise boys, says that hunting teaches empathy and compassion. Adolescent neuropsyschologist, Jim Rose of the University of Wyoming, agrees with Gurian and adds that shooting and hunting teach kids self-control, self-restraint and sound judgement. A professor of education at Northern Arizona University, Don T. Jacobs, Ph.D., author of Teaching Virtues Across the Curriculum, states that, "Hunting is the ideal way to teach young people universal virtues including courage, fortitude, patience, generosity and humility." According to Jacobs, humility is discovering that you're part of something greater than yourself. Also interviewed is forensic psychologist, Helen Smith, Ph.D., author of Scarred Hearts and the world's leading expert on youth violence. Smith says that access to firearms does not cause youth violence, and that teenagers need boundaries and responsibility, which shooting and hunting provide when mentored by adults. Eaton added that the social justification for hunting lies in its positive influence on the development of our youth into compassionate, virtuous and responsible adults who respect life and defend nature. 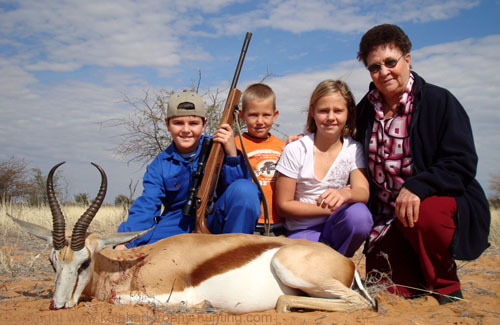 These are some reasons why we especially like to book families hunting with us. We ourselves are also very much a family-orientated business and our family is our pride and joy. The youngsters whose hunting pictures you'll see below, had great hunts. We thank these ladies and gentlemen... we enjoyed your company tremendously! Back Issues of our newsletter are only available to you as subscribers. If you wish to see previous issues of our newsletter Kalahari Hunting News, click here to find those Back Issues! "In the Kalahari there's 3 animals with coats made specially for the warm sun. It's the Gemsbok, Springbok and Steenbok. Their coats are light-colored in order to reflect the sun's rays. They even have white bellies to reflect the intense heat radiating up from the warm-baked sand. In addition, the Springbok often stand in a certain way so that the smallest possible area is exposed to the sun - its white rump can reflect as much as 95% of the sun's rays. Talk about efficient sunblock!" 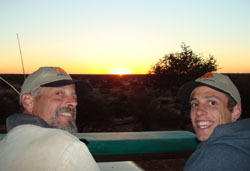 Michael Smith from California, USA, brought his children Allison and Kyle on a hunting trip to Namibia, Africa. 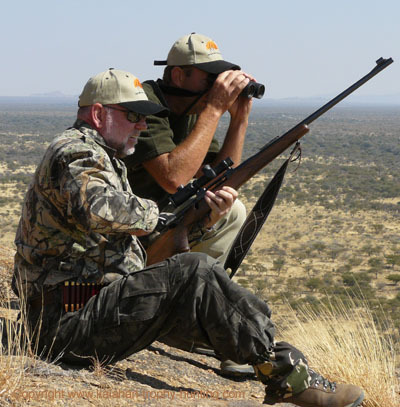 They hunted a Warthog, 2 Springbok, Kudu, Gemsbok, Impala, Blue Wildebeest and Steenbok. The Smiths were excellent shots and can really be proud of their good markmanship. Picture above: Allison joined the hunters often and were introduced to her first real hunt. 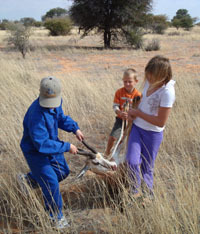 She did well and took this Springbok here on Uitspan Ranch in the Kalahari. 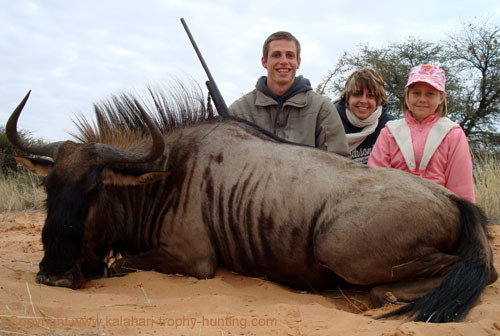 Picture above: Kyle, Allison and Maria with Kyle's Blue Wildebeest. 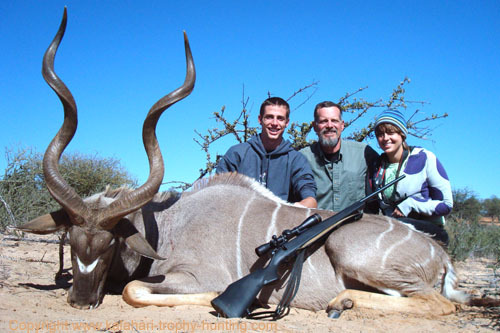 Picture above: Kyle, Michael and Allison with Kyle's Kudu trophy. Picture above: Michael, Kyle and Allison with Tienie around the fire. 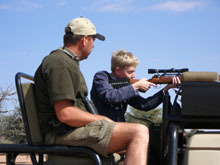 Kobus and Driena Stofberg and their son Pieter spent a week in our camp in the Kalahari. 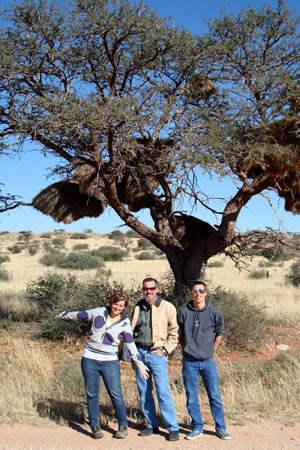 They live in South Africa and the wine-farmer finds the Kalahari's atmosphere peaceful and relaxing. Pieter's grandmother Marie joined them. 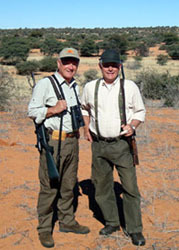 Michael took Pieter on a Springbok hunt and were very impressed with Pieter's perfect shot. Picture above: Pieter was joined by his cousins and grandmother for the picture. Picture above: Hunting is not only about taking a shot. 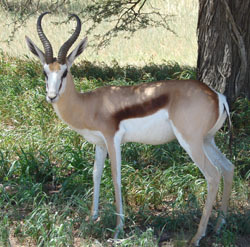 Picture right: Pieter's Springbok and its wide-open pronk. 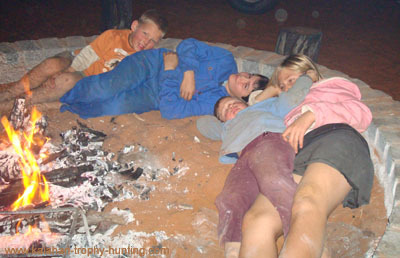 Picture below: Tired of all the excitement... seeking up the heat of the fire on a Kalahari's winter evening. We had Roy and Denise Langley and their twins Carl-Heinz and Bronwyn. Roy work on a gold mine in Ghana, Africa and is an avid hunter. Roy took a Mountain Zebra, Klipspringer, Damara Dik-Dik, Gemsbok, Brown Hyena, Black-Faced Impala, Springbok and Eland. 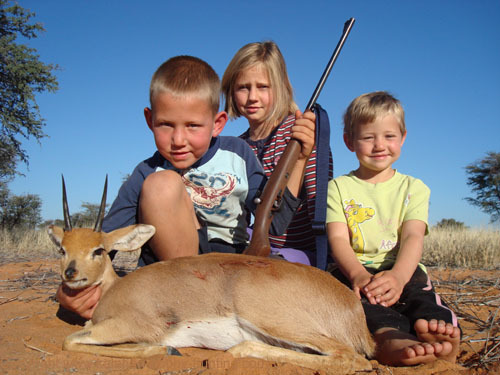 The children hunted a Steenbok and Springbok. Since this issue is especially about the young hunters, we'll publish more of Roy's excellent trophy pictures next time. 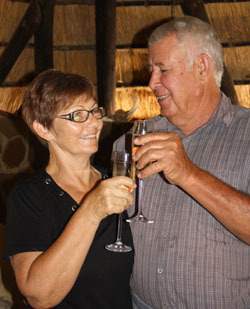 Picture above: Bronwyn and Roy with her first Steenbok. 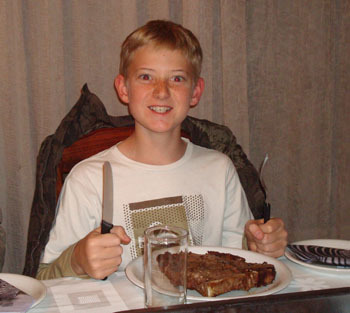 Picture above: Carl-Heinz... the outdoors gives a man enough appetite for an Eland steak! Pictures above: Training from the PH before the hunt can begin... and, time for horse-riding - another outdoor activity. Picture above: Carl-Heinz, Roy and Denise with the Springbok Carl-Heinz took. We are meeting up again with Roy and his family in March this year for another hunting (and fishing) trip. Tiaan Bindeman is a young man from our hometown, Aranos. Every year, his father give him the opportunity to shoot one special trophy, except from some other hunting activities. 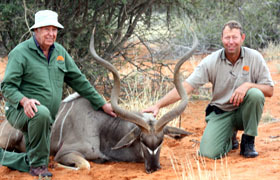 In July 2007, Tiaan hunted a 58" Kudu bull here on Uitspan Ranch. We made him a video of this hunt and if you haven't seen it, you can watch it on the following link: Tiaan's 58" Kudu Hunt"
This year, Tiaan father gave him the opportunity to hunt an Eland. Picture above: Tiaan took this 36.5" Eland trophy. In April 2009 one of our very dear hunting friends from Washington, USA, gave our son Jan-Hendrik a .22 Chipmunk. This gift from 'Oupa' Marshall is really special. Michael trained the children in the safe-handling of fire-arms before they went on their first hunt. Since then there were several opportunities for them to hunt. 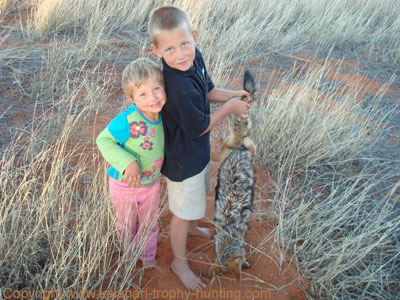 Picture above: Jan-Hendrik and Isabella knows to be happy when a Black-Backed Jackal that kills livestock, could be killed. 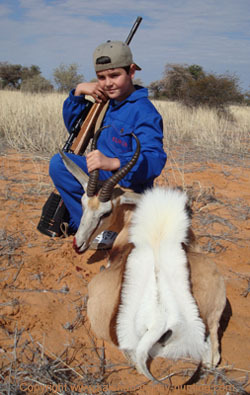 Picture above: Jan-Hendrik hunted this Steenbok with his Chipmunk. Maria and Isabella joined him for the photo. Frans Odendaal, John Paul, Rodney Pretorius with his wife Margaret and son Thomas from RSA. They also hunted for meat. Roy and Denise Langley and their children, from Ghana. We had a blast! Jaco Louw and Riaan Labuschagne from South Africa. Hunting Zebra, Warthog and Red Hartebeest. Click here to read more about the history of our website! Here are a few videos we selected for you to watch. These will bring the Kalahari home to you! We know that it is much more expensive to bring one's family on a hunting trip to Africa and would like to help anyone make such a dream come true. So we've recently updated our special hunting packages. We now give our international hunters the opportunity to also do some essential culling while coming all this way for a hunt. The "Management Packages" are available for this purpose. This gives you as hunter much more opportunity to hunt - for a very good price. 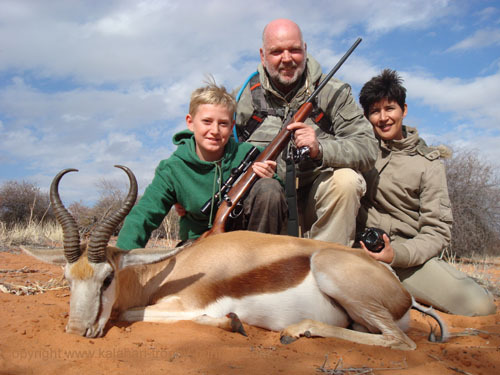 So... if YOU wants to bring your family / children on a hunting trip to Africa, click here to have a look at the new Special Hunting Packages. It may be just perfect for you. 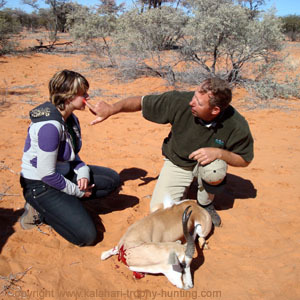 Any comments on Kalahari Hunting News? One truth we must hold on to with both hands and never let go. With Asaph we must say, "Truly God is good to Israel, even to such as are of a clean heart", Psalm 73:1. That truth we must take with us wherever we go and no matter what happens to us. Come what may, God is good to His people. And a clean heart is not vain; nor are hands washed in the blood of Christ worthless. Cleansing our hearts and fighting against sin, washing our hands and believing that our sins have been blotted out by the blood of Christ reveals the goodness of God. In His goodness He causes us to believe. It is in His goodness that we receive His Spirit Who enables us to fight against the sin that still resides in our flesh. Let not the prosperity of the wicked deceive you. Think not that God is good to those whose hearts beat only with the love of sin, and who have no interest in the forgiveness of sins, just because you see their eyes stand out with fatness, and they have more of this earth's goods than the believers. Let not their pleasure-filled lives and prosperity make you judge God to be unfaithful to His promises to His church. Be sure, as we approach the end of time, with its greater persecution and deprivations, that God has not forgotten us and is not blessing our enemies. Be sure that you see things correctly. Therefore, do as Asaph did, go to God's house. Draw nigh to Him where He reveals to us that the "victory" of His Son's enemies, when they crucified Him, actually was the victory for the church over sin and death; and that He is always working all things together for good to those that love Him. To live apart from God is death. Room for Christ: "there was no room for them in the inn. "(Luke 2:7) Speech is very free in this land; but, oh, how little room there is for Christ in our conversations! Even on Sunday afternoon, how little room there is for Christ in some professing Christian homes. ...I address many who are working-men. You are employed among a great many different companies day after day; do you not find, brethren--I know you do--that there is very little room for Christ "in the workplace?" There is room for talk of sports; there is room for lewd conversation, there is room for politics, slanders, or lying talk; but there is no room for Christ. Too many of our working men think Christianity would be an encumbrance, a chain, a prison to them. They can frequent the theater, or listen to some conference speaker, but the Church is too dreary for them. ...The world is elbowing and pushing for more room, until there is scarce a corner left where the babe of Bethlehem can be laid." We thank the PRCA, who made this Daily Meditations of Rev. Heys available for our Newsletter. Read more about their missions, literature and wonderful publications on their website. Click here to visit the PRCA's site. Take a moment and listen here to an audio sermon online. Read here articles on several subjects and what Scripture says about it.